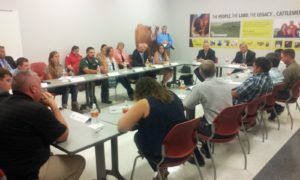 August 17, 2016 U.S. Secretary of Agriculture, Tom Vilsack, invited a group of 15 beginning farmer-veterans to a roundtable discussion about “Opportunities for Beginning Farmers” at Iowa State University. Veterans in Agriculture had 6 representative in the roundtable discussion: Paul Havran, air-guard recruiter & cow-calf producer in Warren County; Aaron and Dana White, crop and cow-calf producers, Carlisle, Ia. ; Todd Dirksen, FSA employee and owner of Dirksen Livestock, LLC. Hampton, Ia. ; Jason Kerr, Kerr Blueberry Farm, DeWitt, Ia. ; and Ray Meylor, Cherry Glen Learning Farm, Polk City. As the men and women shared their stories and concerns, several themes stuck out. Here are some of the biggest challenges facing young and beginning farmer-veterans listed. First and foremost mentioned was access to land and capital. Other items listed were: the fact that landlords want to rent to larger well established farmers; it’s hard to compete with the high CRP rates that landlord are opting to go after; not enough USDA/FSA/NRCS etc. employees and that some are lacking the knowledgeable about all the programs that are available; even though the water quality issue is very important, beginning farmers can’t afford to expense of long-term mitigation; and trouble finding a local meat processing facility that could meet the regulations required to process their home raised products. The Secretary announced to the meeting a new investment of $17.6 million for 37 projects to help educate, mentor, and enhance the sustainability of the next generation of farmers and ranchers for continued support. 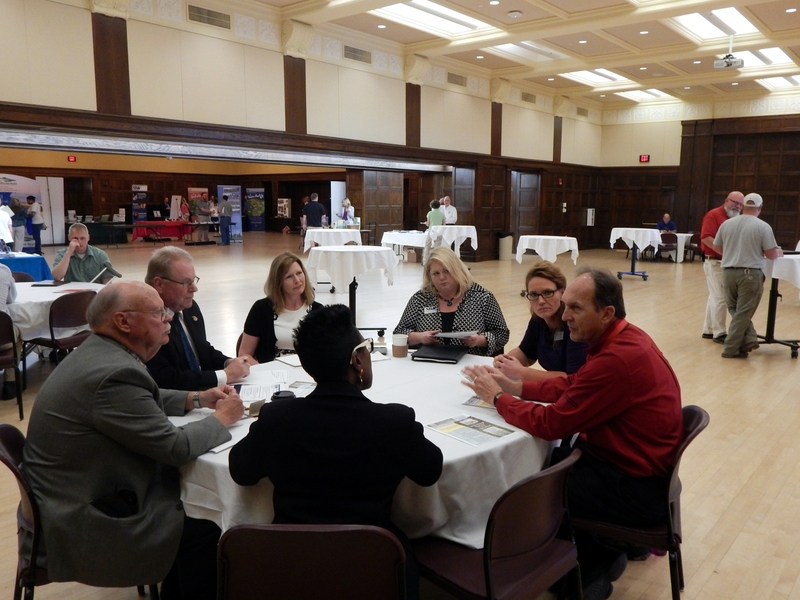 Veterans in Agriculture Board Members had the opportunity to meet with U.S. Small Business Administration administrator on Monday at the 2016 ISU Veterans in Agriculture and Entrepreneurial Conference. Barbara Carson, SBA Associate Administrator for Veterans Affairs from Washington, D.C., requested the roundtable discussion to learn more about Veterans in Agriculture. 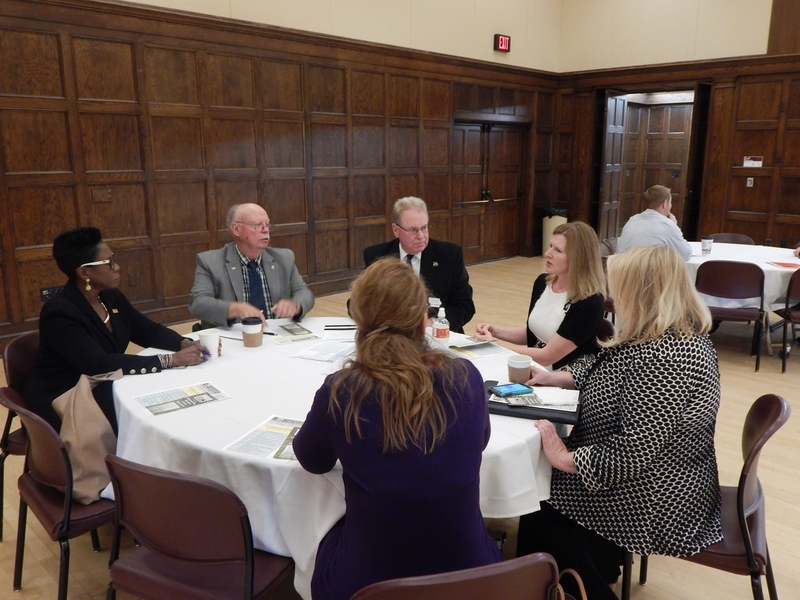 Also attending the discussion was Patricia Brown Dixon, Regional SBA Administrator from Kansas City and Jayne Armstrong, District Director from Iowa. Andrew Joseph is the State Apiarist and Bee Inspector for Iowa. Mr. Joseph is also a Cherry Glen Learning Farm board member. Mr. Joseph, is interested in teaching a Master Bee Keeper course at Cherry Glen Learning Farm for veterans. This class is for existing bee keepers, not for the beginner bee keeper. There has been a big increase in student and adult beginner bee keepers across Iowa. We could start the class in January 2017 or February 2017. Jeff is a Service Connected Disabled Navy Veteran, served during Operation Desert Storm. Served from 1989-1996. I have traveled to such places as Singapore, Hong Kong, Diego Garcia, Kuwait, Bahrain and UAE. Since 2007 Jeff has been involved in Military and Veterans Hiring., as a disabled veteran of the United States Navy, I bring a firsthand knowledge of the struggles that a veteran can face trying to find employment after leaving the military. I also bring firsthand knowledge of what it takes as a veteran to succeed after military service. Jeff most recent work experience was working for the Hero2Hired (H2H.jobs) program. His job included working directly with Employer Support of the Guard and Reserve program, both locally and nationwide in promoting Hero2Hired and the Employment Initiative Program and Job Connection Education Programs through planning, supporting and promoting job fairs. Prior to working for H2H, I worked for the Iowa Workforce Development Veteran’s unit. As a Local Veterans’ Employment Representatives (LVER) specialist, I helped in developing job and training opportunities for veterans, with special emphasis on veterans with service-connected disabilities and provide direct services to veterans enabling them to be competitive in the labor market. Jeff will represent VIA and serve as the main public contact and spokesperson for the organization, and will represent the organization and all professional business capacities. Jeff and his wife live in Norwalk. Please join us as we welcome Jeff Johnson to our organization and hopefully you will have the opportunity to meet and work with him in his capacity as our executive director. On June 4th, 2016. Operation Engage America will hold their 3rd annual event at Camp Dodge, in Johnston Iowa. OEA facilitates free resource fairs for military members, veterans, and their families. This is a time that military members, veterans, and their family can meet one another, get some free food, a free haircut, and learn about the different services specifically designed for them through local organizations. The event starts off with an introduction followed by two special speakers, Jathan Chicoine, a former Navy Seal, and Chris Anthony, a Vietnam Veteran. Between approximately 11:30 a.m. and 2:00 p.m., guests are encouraged to walk around and get free information from the various vendors. A special thanks to the Iowa National Guard, Sports Clips, Jethro’s BBQ, Tiefenthaler Meats, and Little Blackbird Bakery. Practical Farmers of Iowa – Field Day May 9th – 9 a.m. – 11 a.m.
Cherry Glen Learning Farm, 3989 NW 94th Ave, Polk City. Each year, nearly 200,000 servicemen and women separate from active duty in the United States military. According to the Department of Defense, this results in approximately 1,300 new veterans and their families returning to civilian life every single day, numbers that are expected to increase in the coming years. While many returning troops have plans and objectives upon their return home, many others have challenges finding new jobs, identifying health care resources, or integrating their skills into new careers. For veterans exploring the next step in their careers and lives, USDA stands ready to help. With rural Americans comprising only 16 percent of our total population, but about 40 percent of our military, USDA believes that the enormous scope of unique skills, experiences and perspectives held by those who served in the U.S. military can have enormous benefit for farming and ranching. 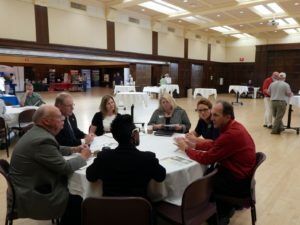 That’s why USDA Deputy Under Secretary for Farm and Foreign Agricultural Services Lanon Baccam, who also serves as the department’s Military Veterans Agricultural Liaison, recently visited Ft. Bliss in El Paso, Texas, as part of the Hiring Our Heroes Transition Summit. Hiring Our Heroes is a nationwide initiative sponsored by the U.S. Chamber of Commerce Foundation that helps veterans, transitioning service members and military spouses find meaningful employment opportunities in the civilian sector. In February 2015, USDA entered into an agreement with Hiring Our Heroes so that transitioning service members now have access to USDA programs and resources. The Ft. Bliss event marked the first of several transition summits in which USDA will participate. Not knowing what to expect in terms of soldiers’ interest in USDA employment or farm and ranching opportunities, USDA agency representatives who accompanied Baccam said they were pleased with the turn out. More than 120 service men and women attended USDA’s session, learning how they, too, could establish a livelihood and lifestyle in rural America and in the agriculture industry. An Army veteran, Baccam said that transitioning from the military to the agriculture industry is a natural fit for many. Hard work, loyalty, dedication, perseverance, patriotism and sense of duty are values common to both military service, farming, ranching and rural America. As a Sergeant, Eilers served as team leader in the U.S. Army’s elite First Ranger Battalion. Case in point: Joshua Eilers of Ranger Cattle in Austin, Texas. As a Sergeant, Eilers served as team leader in the U.S. Army’s elite First Ranger Battalion. Although raised in a rural community outside Austin, Eilers had no background in production agriculture. Fast forward post-military and you’ll now find Eilers managing his herd of full blood Wagyu beef that he markets directly to retail establishments and restaurants in Austin. Eilers fully supports USDA’s efforts to transition veterans into careers with the department or into production agriculture enterprises. “Veterans should take advantage of all that USDA has to offer. USDA services and programs are meant to help you; so let them help you,” said Eilers. USDA is scheduled to participate in several more Hiring Our Heroes events at military installations throughout the U.S. For more information on USDA services and programs for veterans and military personnel, please visit www.usda.gov/veterans or contact your local USDA offices by visiting http://offices.usda.gov. March is National Nutrition Month. Throughout the month, USDA is highlighting results of our efforts to improve access to safe, healthy food for all Americans and supporting the health of our next generation. We could not have done this work without the support of our partners. Below is a story from one of our partners, the National CACFP Sponsors Association. Family child care homes, as well as some child care centers and afterschool programs, participate in Child and Adult Care Food Programs under sponsoring organizations. The ongoing support and training that sponsors routinely provide helps CACFP providers serve nutritious meals and keep children healthy. Did you know CACFP provides 1.9 billion meals and snacks for over 3.3 million children? Hunger is unacceptable to everyone. To combat the food insecurity that one in four Americans face, there are a number of government programs designed to provide access to healthy food. Many people know about USDA’s school lunch program and you may have even heard of the WIC program, but did you know that the Child and Adult Care Food Program (CACFP) provides 1.9 billion meals and snacks to over 3.3 million children in child care centers, family care homes and after-school programs? In addition, CACFP provides that same access to over 115,000 elderly persons in adult day care. The primary goals of the CACFP are to serve nutritious meals to children and help establish positive eating habits at the earliest stages of development. Research indicates that the CACFP is an indicator of quality child care. Children that are cared for by providers participating in the CACFP benefit by being fed nutritious, USDA regulated meals that ensure their proper development. These children gain from early nutrition education that helps them establish positive eating habits that will enrich the quality of their diet throughout their life. Child care providers receive nutrition education and support services from their CACFP sponsors who help them serve nutritious meals and create a positive eating environment for children. The quality of child care provided in our community is improved due to educational and financial resources available to caregivers through the CACFP. There are thousands of people who are making sure preschool children in America are getting access to healthy foods on a regular basis and many of our neighbors haven’t ever heard of it! That’s one of the missions of the National CACFP Sponsors Association (NCA) to raise awareness across the nation and encourage communities to come together to learn and acknowledge the many ways we all benefit from the hard work and dedication of CACFP professionals and the program itself. The NCA knows that when we all join forces and work together the message we provide is stronger and will receive more attention. Free resources are available at www.cacfp.org.